“In my cowboy-knight-to-my-rescue mind, I always pictured my Boaz showing up some day. The junk mailers we receive with coupons, ads and marketing techniques trying to get our attention, I usually toss in the trash. A few weeks ago, for some reason I thumbed through a mall magazine. To my astonishment appeared a horse rescue ranch ad that made me mini-gasp. Could this be a possible answer to wondering what my re-adjusted purpose in life is? I had volunteered years ago at a horse therapy ranch and a horse rescue and absolutely loved it. But with a bionic body, could I still utilize my equine passion? There was the horse ranch ad staring at me but blaring with good news! I emailed immediately and started a wonderful relationship with the owner. When she told me one of the horses was named “Boaz”, I wept in a split second. 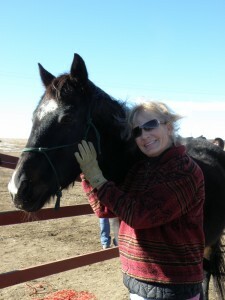 I have met Boaz the horse, a thoroughbred who was brought back from starvation and is now used to help heal people. I CAN help at the ranch. I can groom, halter, lead and feed, and scoop poop as well as relate to the hurting children and adults that come to this region of recovery. They have also been neglected, abandoned or are just sore from what life has handed them. I CAN relate to them and try to ease their lameness. 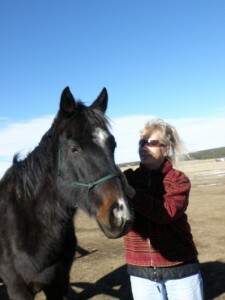 I believe there is nothing like being around a horse to help a hurting soul. Boaz the horse has now taken a tender place in my heart. God has shown up in an instant through a horse named Boaz to rescue me and use me to help others at the same time. This is another personalized miracle created for me, just like Jim was. There is no doubt this is another divine match, just as Jim and I were. And God gets all the glory!